In today's social media, online dating, and telecommuting world, it seems ironic to call a film about an emotionless society that repels human connection science fiction. But with stunning cinematography, futuristic effects, and an impossibly controlled narrative, that's just what EQUALS is. Premiering at the Tribeca Film Festival, the sci-fi romance takes a look into the the not so distant future in which human emotion is obsolete--in fact, stigmatized--and relationships are strictly outlawed. The premise alone is enough to create high tension in its stark setting that's swarmed with single-dimensional people living in close quarters yet none of whom share more than a forced greeting as they glide pass each other throughout the day. That is, until Silas (Nicholas Hoult) begins to notice Nia (Kristen Stewart). A forbidden moment turns into a dangerous affair that leaves the two questioning everything they ever knew about people, their world, and love. Directed by Drake Doremus (Like Crazy) and written by Nathan Parker (Moon), EQUALS is an immersive film that captures the fragility of romance in a hopeless society--punctuated by a pair of tender performances. Hoult continues to be criminally underrated as a young actor who can find the humanity in even the most soulless character like Silas. While Stewart has finally found a role that complements her oft restrained acting style in a way that seems neither awkward nor disingenuous. As the hardened half of the two, she brings an explosion of emotion when you least expect it; while Hoult is the level-headed yet desperately curious one. 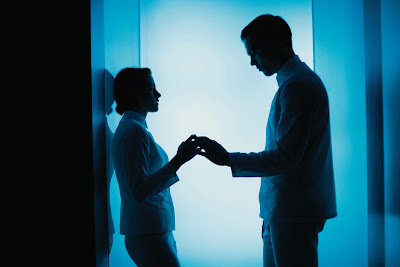 Despite its terribly shaky camera angles, EQUALS is a deeply passionate narrative that highlights themes of deviance, control, and active disconnect--all of which can just as equally be associated with modern culture. I saw the trailer months ago and was sold on that. I'm glad you enjoyed it!